Are you a water sport enthusiast? Turkey is a paradise for water sports adventurers. Some are lakes, some are seas, and all are natural. Over 8,000 km of coastline, crystal clear waters, numerous beautiful rivers and sparkling lakes make Turkey one of the most spectacular water sports destinations in the world. Turkey is one of the best windsurfing destinations in the world. If you have ever wanted to learn windsurfing, Turkey is a great place to start this exciting and exhilarating sport. Sea kayaking around the secluded bays and ancient ruins of Turkey. 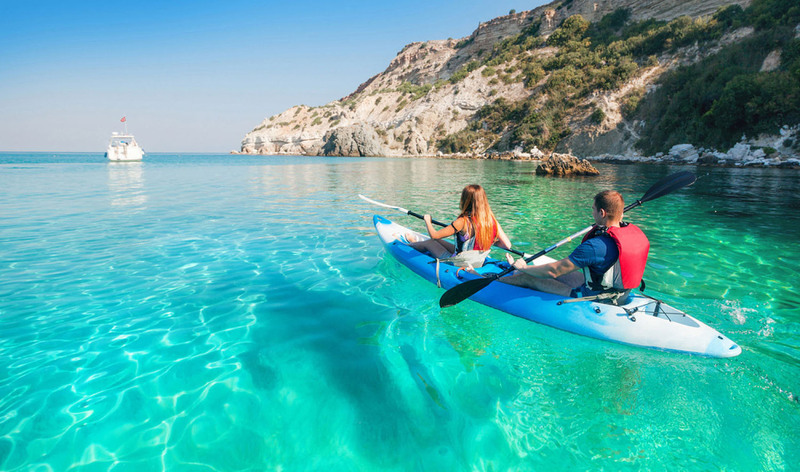 The coastline of south-west Turkey, where the Aegean meets the Mediterranean, is a paradise for sea kayakers. Turkey has a number of beautiful sparkling rivers, which are suitable for whitewater river rafting, offering a challenge to everyone from beginners to experts. A great variety of fish species, coral reefs, wrecks and all other underwater beauties are waiting to welcome diving lovers at diving destinations in Turkey. Turkey is one of the best locations in Europe for canoeing with its crystal clear seas and whitewater rivers. Let the river waters take you on a memorable journey towards the sea. Come explore our turquoise coastline that has it all – rich underwater fauna, caves, and shipwrecks thousands of years old. That is why scuba divers often call Turkey as the wonderland. What is your next summer adventure? Kiteboarding? Turkey has the perfect spots for kiteboarding and much more. Turkey is home of summer fun and kiteboarding. Turkey is the truly heart of the best spots for water sports, including the top list of places for diving, windsurfing and rafting. The list of the best windsurfing spots in Turkey, selected by the jury comprised of windsurfers, sports writers, instructors and lovers of extreme sports. The list of awesome white water rafting places in Turkey; Coruh River, Dalaman River, Koprulu River, Firtina River, and Goksu River. Kitesurfing is one of the most popular extreme water sports in recent years for those who want to enjoy the sea and wind. Discover the top kite spots in Turkey, one of Europe's most popular kite surfing havens.